Athens doesn’t need to be expensive if you are on a budget. 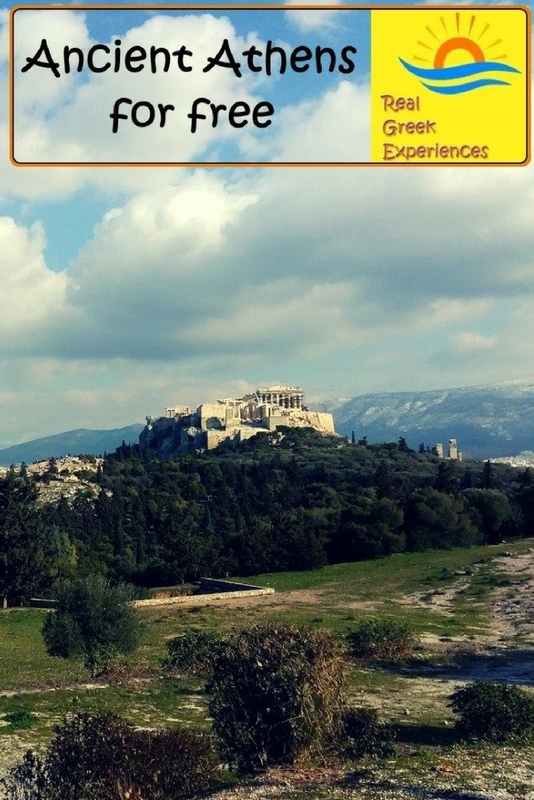 Here are a few tips on how to see Ancient Athens for free! Although the monuments of Ancient Athens are definitely worth the 30 euro entrance fee, some people may not want to spend that money. If you are prepared to walk a lot and see things from a distance, it is possible to enjoy the ancient monuments for free. In our opinion, the best way to explore a city is on foot. And there is no pedestrian street in Athens as magnificent as the street stretching between Acropolis metro and Thisseio metro. The street was pedestrianised only in 2004, a while before the Olympic Games. There are very few places in the world when you can walk in the centre of a city and be surrounded by ancient monuments, trees, locals, visitors, street artists and street vendors. 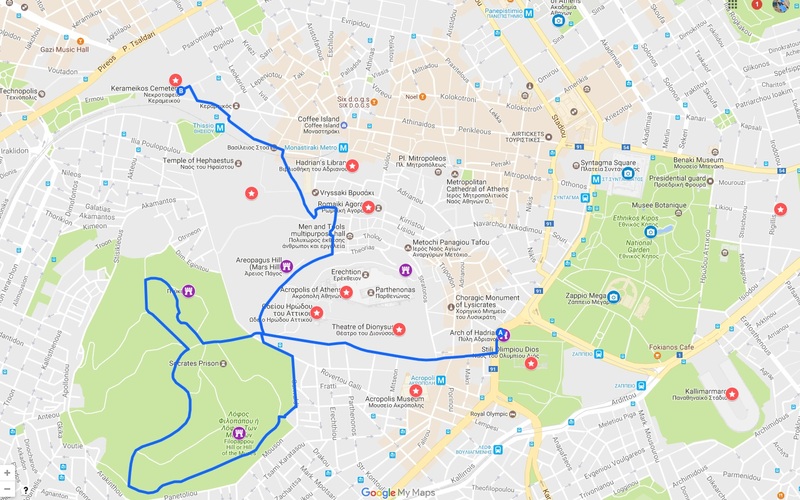 The walking route follows along Dionysiou Areopagitou and Apostolou Pavlou Pedestrian Streets. 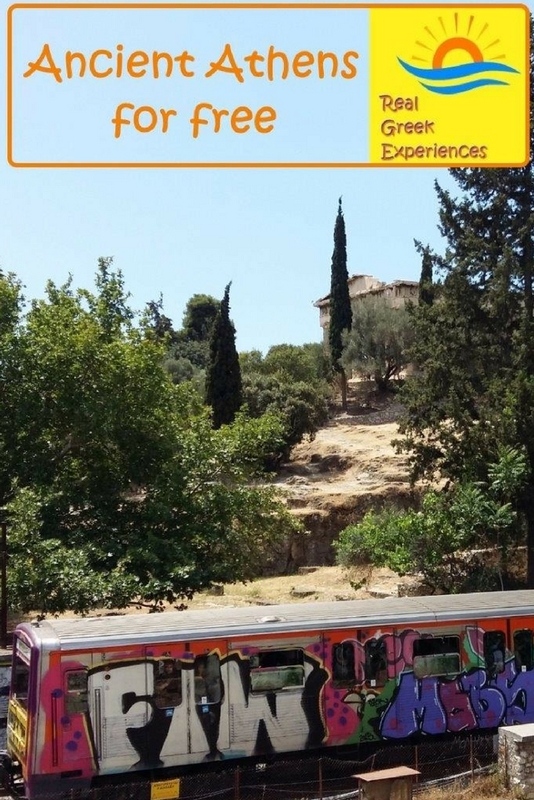 This is what you can expect to see along the way, starting from Acropolis metro station and finishing at Kerameikos. Points highlighted in purple are free, and those marked in red require a ticket. We have also marked in blue other points of interest that are free of charge. Turn left, and in a few minutes you can see the Kerameikos ancient site (ticket needed). You can admire the site from the outside. The nearest metro stations are Thisseio and Kerameikos. This huge gateway is located alongside a modern avenue. It was built in honour of the Roman emperor Hadrian, in 131 AD. It is entirely made of pentelic marble, and is very well preserved. Tip: If you stand near the arch of Hadrian, you can’t miss the Temple of Zeus nearby! 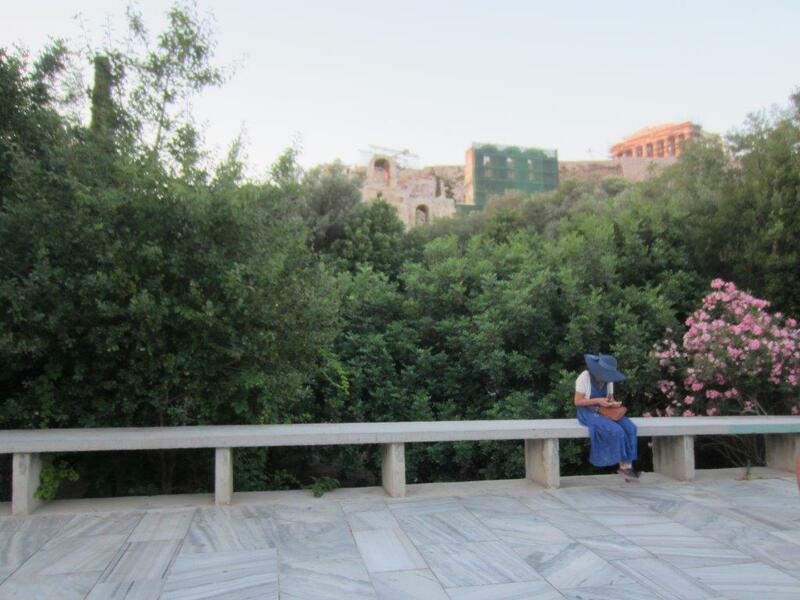 This amazing green area right in the centre of Athens, is very popular with locals and visitors alike. You will see locals walking their dogs and strolling up to the top, and visitors taking pictures of the Acropolis. The Hill is best known as Philopappou Hill, named after the prince Philopappos, who was of Syrian descent and died in Athens in 116 AD. To honour his memory, the citizens of Athens built a grand marble tomb monument on the top of the Hill, which still stands in great condition. The famous Greek philosopher Socrate’s prison is said to have been somewhere on Philopappou Hill. The exact location is probably not certain. 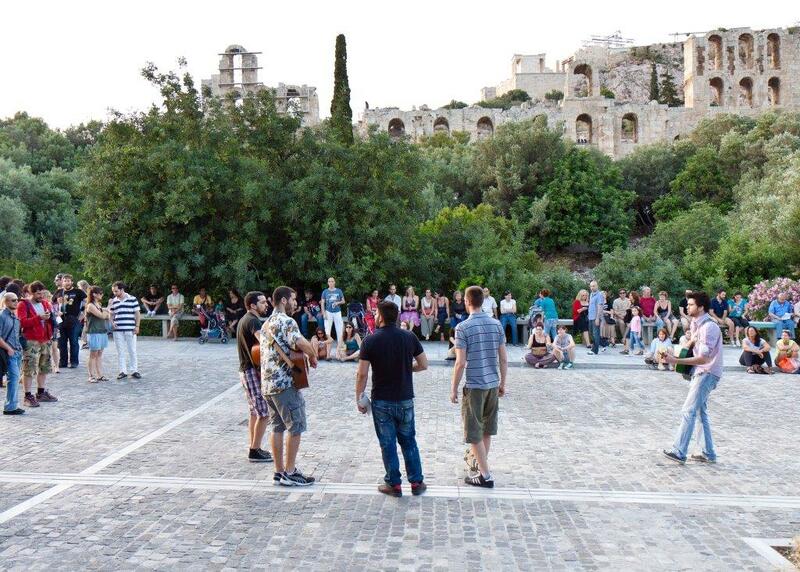 If you are visiting in summer, you can consider checking out a performance in Dora Stratou Theatre. 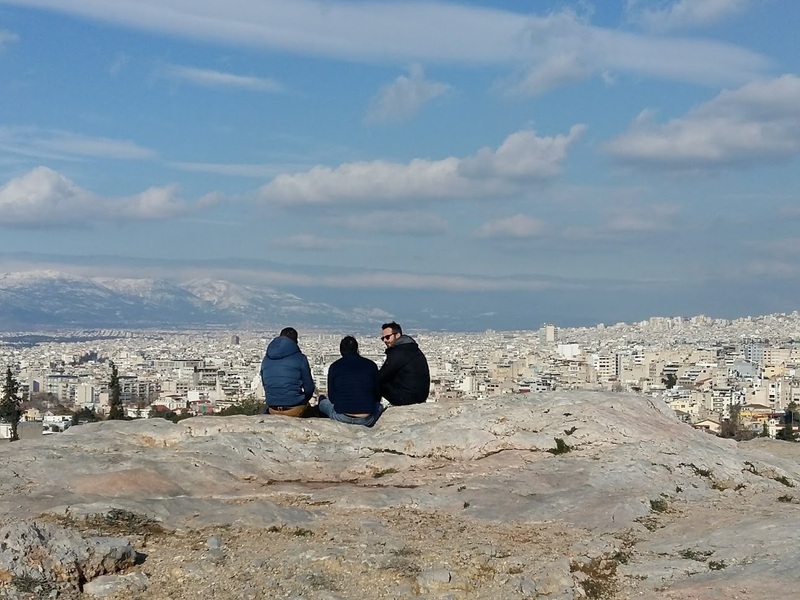 Tip: Do not forget your camera, as Philopappou Hill offers some of the best views of the Acropolis! Right next to Philopappou Hill, you can find another hill with the rather unusual name “Pnyx”. This is one of the most important places in ancient Greece. Pnyx is the place where the Athenians gathered to host their popular assemblies (ekklesia), after political power was transferred to the citizens, towards the end of the 6th century BC. At that time, the Pnyx was right outside the city borders. All the important Greek politicians, statesmen and speakers that you may have heard of, such as Pericles, Aristides and Demosthenes, once delivered a speech on the Pnyx. This is where all important political decisions were taken. Any Athenian citizen had the right to speak during an assembly – at least in theory. If you are visiting Pnyx Hill on your walking route to see Ancient Athens for free, you can also visit the National Observatory of Athens. Tip: While on the Pnyx, you can pack a picnic and enjoy the amazing views! 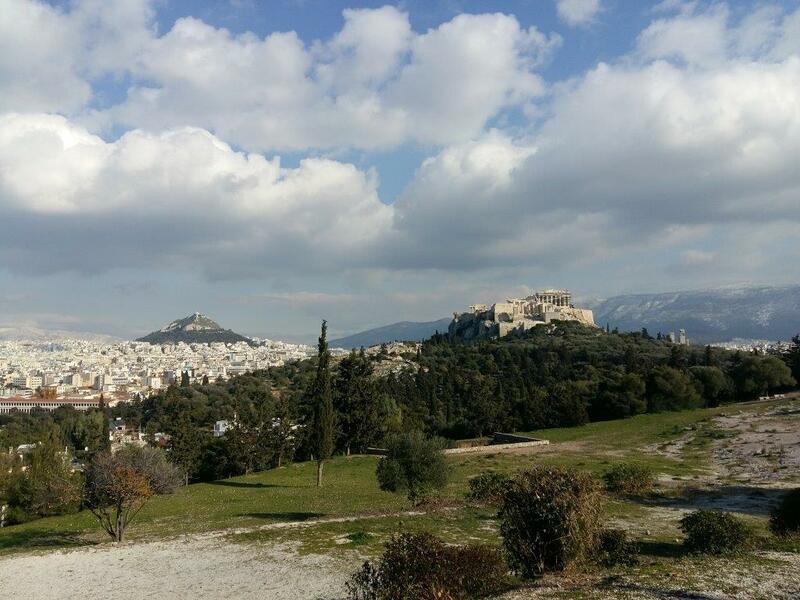 Areopagus Hill, also known as “the Rock”, is a large rock very close to the Acropolis. In the ancient times, it served as a court, where homicide trials took place. According to some historians, trials only took place after dark, and never on full moon nights, because murderers were considered to be unholy, and the judges and audience should not be polluted by their sight. In 51 AD, Apostle Paul delivered his famous speech on the Areopagus. The Rock offers an excellent view of the Acropolis and the surrounding area, and is lovely at absolutely any time of the day. 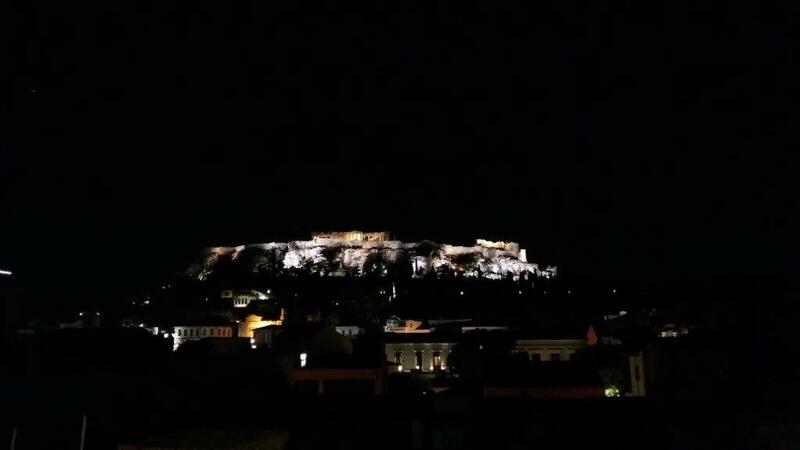 Our favourite time to be there is probably around sunset, when Acropolis is being lit up, or even at night. Then again, the view is amazing first thing in the morning! Tips: You can climb up the hill on either the ancient rocks, or the modern metal stairs. We strongly suggest wearing comfortable shoes, as they can both be very slippery! Finally, if you happen to be in Greece on certain days of the year, you may visit the ancient sites in Athens for free. Prepare, however, to meet plenty of other people who had the same idea! If you are lucky enough to be an EU student, or you are under 18 years of age, you can also visit the monuments for free, with a valid student ID. If you have any questions about seeing Ancient Athens for free, you can leave a comment below!